This coverage of the 2016 National Investment Center for Seniors Housing & Care Fall Conference is brought to you by Mainstreet. As the nation’s largest developer of transitional care properties, Mainstreet specializes in real estate development, value investments and health care. With Mainstreet’s support, SHN is bringing event coverage of the NIC conference, which draws developers, providers and operators within the post-acute and preventative health care services space. After a slow year, merger and acquisition activity in senior housing could roar back to end 2016, as REITs reconfigure their portfolios and a diverse investor base brings capital to bear. Labor shortages in senior housing are real, said Beth Mace, NIC’s chief economist and director of capital markets research. Strong job gains have put the unemployment rate at about 4.9% on a national basis, creating tight labor markets that make it harder for senior housing to fill positions. The pinch is being felt both at the executive director level and with regard to frontline workers, she noted. Also of concern are construction worker shortages, which in some instances are preventing projects from coming in on their pro forma timelines, she said. Senior living providers are starting to get creative with their recruitment and retention strategies, and lenders such as Berkadia are looking closely at how operators are addressing this issue, said Christopher Honn, senior managing director of Berkadia’s Seniors Housing and Healthcare Team. One operator that works with Berkadia has demonstrated the ingenuity that the industry may need more of, by starting to recruit former police officers. A silver lining on the labor front is that wage pressures overall have not increased as one might expect with falling unemployment. One reason is the worker mix involved, with older and more experienced workers retiring and being replaced by younger employees who are being paid at lower rates, Mace explained. Leaders with some of the nation’s largest providers confirmed Mace’s point on wages, although they emphasized that it varies by market and by type of employee. “Generally speaking, we haven’t seen a lot of wage pressure, with the exception of this: There are some markets of ours where the labor market is tight,” said Andy Smith, CEO of Brookdale Senior Living (NYSE: BKD), the nation’s largest private-pay senior housing provider. Specifically, markets on the coasts and a few in the Midwest are of concern. “In some of our skilled nursing communities and with respect to RNs in our assisted living, we’ve seen a little wage pressure there too,” Smith said. Brookdale normally expects about 2.5% wage rate growth, but is anticipating that be more like 3.5% this year—but the Brentwood, Tennessee-based company so far is running a little lower than that, Smith said. Another major publicly traded senior housing company, Capital Senior Living (NYSE: CSU), is seeing even less impact on wages, in part because it employs fewer RNs. 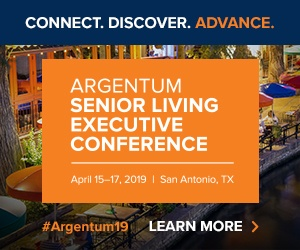 Based in Dallas, Capital Senior Living targets markets in regions such as the Midwest and Southeast that have not seen such tightening labor markets. One notable exception is Omaha, Nebraska, said CEO Larry Cohen. However, the company is keeping wage rate growth just under 2% overall. In addition to its market selection, Cohen credited the company’s ongoing process of converting units, which is improving staffing ratios and efficiency. Likewise, Louisville-based Kindred Healthcare (NYSE: KND), the nation’s largest post-acute and home health provider, is seeing wage pressure in pockets. Home health workers and therapists generally have seen “muted” wage growth, but at the RN level it has been more significant, said CEO and President Benjamin Breier. “If average wage rates have been in the 1.5% range, they’re probably 2.5% today, so they’ve gone up a full tick,” he said of the nurse category. Dealmaking was sluggish for the first part of 2016, in large part because the public real estate investment trusts (REITs) had lost some of their cost of capital advantages. But there were signs of life throughout the summer, including a $1.15 billion portfolio acquisition made by “Big 3” REIT Welltower (NYSE: HCN). REITs do appear to be in a better position to do deals, and there are some major transactions in the works, according to sources who spoke with Senior Housing News at NIC. In addition to the REITs, foreign investors are bringing their capital to U.S. senior housing, and private equity players continue to be active. Another source of capital that Honn noted: “friends and family” investors, who are high net-worth individuals from a particular area who contribute to an investment fund for senior housing projects in their locality. Various factors are motivating investors and driving activity. Turmoil overseas may be attracting investors who see the United States as a safe haven. With the interest rate environment appearing more stable than some had predicted at the start of the year, the REITs have regained a surer footing. But they also are putting properties on the block for others to pick up, as they follow through on divestment plans revealed earlier in 2016. Welltower, for example, targeted $1 billion in divestments this year. “When you see properties that perform strongly, and they’re under a triple-net structure with an operator and REIT, and the escalators over time have grown to the point where it’s taking all the cash flow out of the building just to pay the rent, that’s not sustainable, so that’s another reason for this sales activity,” Honn said. Among the deals making news in the past few weeks: a JV involving Chicago Pacific Founders acquired a $180 million independent living portfolio; Mainstreet Health Investments added five properties to its growing portfolio; Enlivant announced it has acquired 48 properties in the past several months; regional provider MBK Senior Living announced the recent addition of six new properties and its intentions to double its portfolio; and REIT National Health Investors (NYSE: NHI) picked up three senior living communities. Concerns around senior housing supply are ongoing, with development still booming. However, repeated messages that overbuilding appears to be concentrated in certain markets may be hitting home. So far, supply and demand are converging but absorption rates suggest an equilibrium is still being maintained, on a national basis. Some differences exist, though, between different types of senior housing assets. Developers avoided independent living coming out the Great Recession, as the product was perceived as more vulnerable to economic downturns. This held back construction to some degree and allowed occupancy to rise, Mace observed. However, recent data suggests that this is something to watch closely because “significant construction” of IL that currently is occurring could change the equation, she noted. For assisted living, there was more of a development surge following the financial collapse, but demand has largely kept pace. Still, these big-picture observations need to be kept in perspective, Mace stressed. “If there’s one takeaway from coming to a NIC conference, it should be that all markets behave differently,” she said. To make her point, she shared occupancy trend information for 31 major markets. Over the prior 12-month period, 14 of these markets had occupancy declines, and some of these were significant. Atlanta, Orlando, Miami, and Kansas City are among the trouble spots. However, 15 of the markets experienced occupancy increases. The importance of disciplined development indeed was a theme among those who are expanding at the moment, such as Cascadia Senior Living & Development. Based in Yakima, Washington, the company has both development and operations arms, through which it creates and manages its Fieldstone brand of assisted living and standalone memory care buildings. With three communities already open since its founding in 2013, the company has two more under construction, and has land under contract for an additional two as well. Overall, it is positioned to have 10 communities in Washington in the next few years. Founding partners Doug Ellison and Justin Younker bring senior housing expertise from their past roles with Wilkinson Development, and they are mindful of supply issues. They want to grow but are seeking scale within a relatively tight zone, wanting to remain within a two- to three-hour drive of all their properties. Younker shared more about their development strategy.